Just received your card reader? 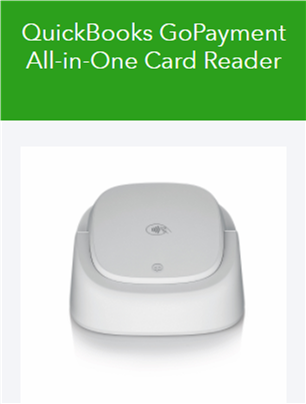 Here's some helpful information about your new Bluetooth card reader. GoPay app for iOS v9.0.0 or higher. GoPay app for Android v6.0.0 or higher. Transactions download into QuickBooks Online via Gear > Import GoPayment. GoPay for iOS v9.0.0 or higher. GoPay for Android v6.0.0 or higher. Transactions import into QuickBooks Desktop via Record Merchant Service Deposits. Compatible with QuickBooks Desktop 2018 R4 using the USB to micro-USB connection. GoPayment transactions would import to QuickBooks Desktop Point of Sale via Mobile Sync for v18. QB21 and QB31 do NOT interface directly with QuickBooks Desktop Point of Sale. Need help with setting up your Bluetooth card reader? 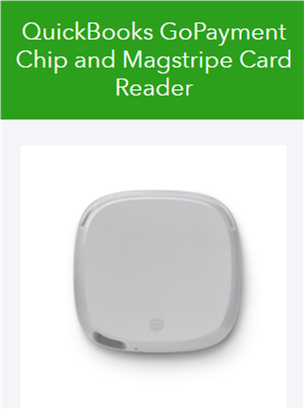 Go to Set up Bluetooth Card Reader for GoPayment or QuickBooks Online mobile for instructions.